It’s camellia season here. We have two camellias, a red flowering variety and a more compact white flowering variety. I put up a jar of camellia flowers a while back using the Stuff Steep and Store method… I couldn’t resist trying! For those who don’t know what I am talking about–this is a method of ‘preservation dyeing’ developed by India Flint and published in this book. There is also a rather wonderful online pantry of people’s dye jars to peruse and become inspired by, should you wish. However, I had no idea whether camellia flowers give reliable dye when I stuffed those blooms in the jar. So I felt heartened when I found Aphee showing her camellia dyes on Ravelry. She has posted about them on her blog a few times, too. She was inspired by a Japanese blog. My French is not very good, but my Japanese is non-existent: I enjoyed the pictures though!! 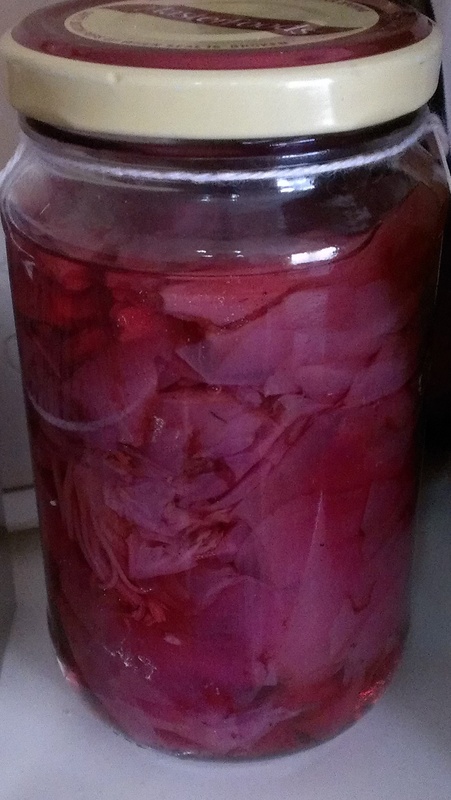 Aphee’s posts suggest that camellia flowers give colour, that the contents of my jar are a promising combination, and that the nature of the dyestuff is exactly the kind India Flint says Stuff, Steep and Store works especially well for. This, I had hoped for, but not expected. 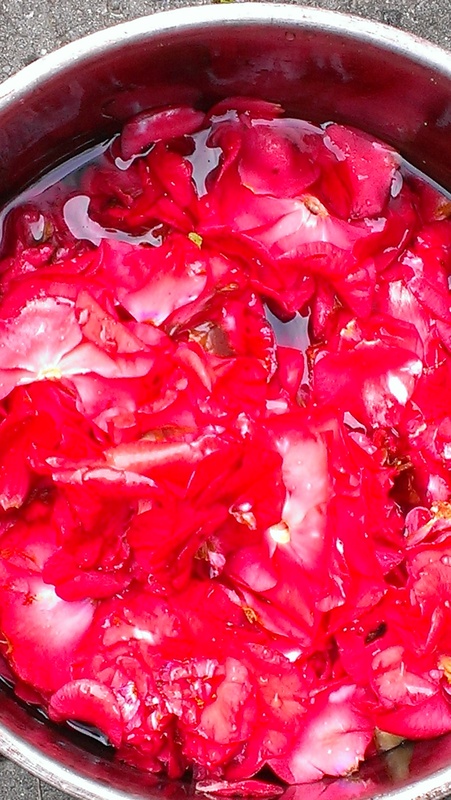 I decided that while the camellias were blooming, I may as well try dyeing by more usual methods. I gathered all the fallen blooms and tried to rinse the mud and mulch from them. 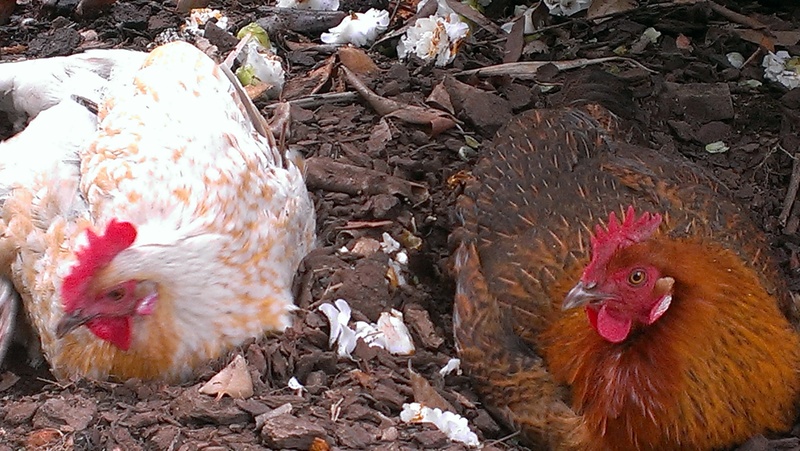 Meanwhile, our chooks were out wandering the yard–and the camellias are their favourite dust bathing spot. The edge of the bed must be in the rain shadow of the verandah, so the soil there is still dry while the whole garden has been generously rain watered lately. They left big circles of earth on the paving where they shook out the dust once they were finished! The camellias soon turned brown though I kept the heat low. This is one of the reasons the preservation dyeing method seems so promising for dyestuffs like these. Well… the result in this case was not impressive. This test sample was barely nudged out of the cream and white it was before dyeing. Longer heating didn’t change that at all. 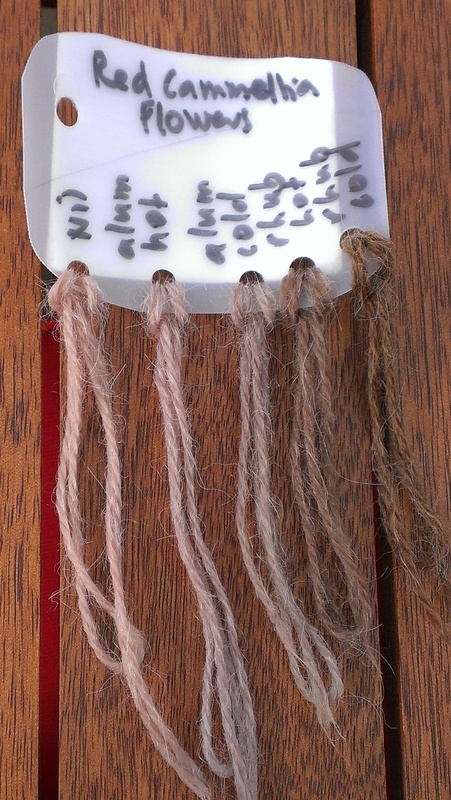 So–let that be another example of the mysterious in natural dyeing for the time being. Aphee is doing something differently to me and I have no idea what it is! I’ll put the next clutch of fallen blooms in jars until I have a new thought… who knows what I might learn between now and next camellia season? I think she’s saying that last time she froze the flowers (and pistils) for 3 weeks and the merino superwash wool, which had been mordanted with alum (20%) for several days, turned purple/mauve (violacer means to turn purple!) on drying, and on rinsing using demineralised water, turning blue with tap water , but this time she used fresh flowers, pink with no pistils, non-superwash merino, silk and no idea what glitz is, not in my dictionary, mordanted with alum several months before, no becoming mauve on rinsing with tap water, nor on drying, but that pink …. I think the glitz might be prefelt or something judging by the photo. she doesn’t say anything about how long or what temp she dyed them at though! secrets! will be very interesting to see what result you get with the steeping – I would think it would be more promising. or perhaps the freeze/melt method in India’s book would work? I had to laugh out loud at how little I had understood 🙂 thanks so much for sorting me out! I had a look on google translate because my Japanese wasn’t good enough to read it. However some details seem to make sense. “First, I gather the petals in an amount of 10 times the amount of silk. Flowers that fell on the road Potorito, I will pick up those little flaws. (After the rain seems to be good) and I put it in plastic bucket of water 3 times the amount of petals, and create a solution at a concentration of 1% citric acid. You made ​​it with 7.5 liters of water because it was petal of 2.5 kg this time. Generally, should become to how much the petals will be lapping[?]. When I put the 1st half a day – while crowded rubbing by hand, the solution will change the color of the flower gradually. I will also run this past a Japanese friend of mine at the Canberra Spinners and Weavers and see what she says the method is. also she says she dyed the silk over 3 days, but I think she says it’s not light fast, but fun and smelt beautiful! Thanks! That is helpful detail! Wow! Thanks for helping me out in my illiteracy 🙂 the think tank on this blog is amazing! sounds like no heating involved at all – citric acid is interesting. we used citric acid to help tannins to co-mordant madder and some of the other plant dyes in Michel Garcia’s workshop. Much more logical than what I tried out…. mmm citric acid my kids use it to make sherbert ! I shall sprinkle some on some silk and see what happens …. Will wait to see what happens. I have never understood about sherbet! Thanks–it seems like t5his is the method Aphee was using… more or less. Thanks for quoting me, I’ve just seen your article. The recipe I used is mainly sum up in the 1st comment. For the last 3 months I made light fastness test but at last I didn’t see the difference between the part at light and the one in dark, so I span it with other fibers. I don’t remember where I read it but the dye seems to be not anthraquinone but anthocyane, so senstive to light and pH. So that’s why I was quite surprise when the test with fresh petals didn’t seem very sensitive to pH. Thanks for sharing your experience and knowledge. Sorry to be a very poor French speaker! I appreciate your generosity as well as your dyeing expertise.